Offering you a complete choice of products which include bistos fetal monitor and contec fetal monitor. We are distinguished organization engaged in providing premium quality Fetal Monitor. These monitors are manufactured in stringent conformity with the worldwide standards. Owing to its precise results, automatic fetal movement detection recording, high functional efficiency and longer service life, our offered monitors are highly acknowledged in the market. Moreover, fetal monitor are offered with TFT color screen, which has elevated resolution and displays clear results. Available in light weight, space-saving, easy to use construction finish, the accurate and consistent performance based Fetal Monitor come with 8.4’’ LCD screen and folding support of 60 degree. Coming with option of displaying waveforms and digital data simultaneously, it supports storage and review possibilities of 12 hours data and waveform generated. Some of the other standard features of the system includes FHR upper and lower limit alarm, twins monitoring function option, built in high resolution and long life printer support as well as option of PC network connection to the central monitoring system. We are distinguished organization engaged in providing premium quality Fetal Monitor. These monitors are manufactured in stringent conformity with the worldwide standards. Owing to its precise results, automatic fetal movement detection & recording, high functional efficiency and longer service life, our offered monitors are highly acknowledged in the market. 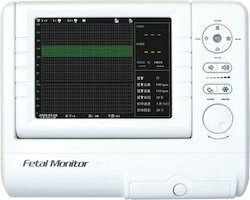 Moreover, fetal monitor are offered with TFT color screen, which has elevated resolution and displays clear results.